Our science educators are not just educators, they are sometimes entertainers too! We cater for all sorts of events ranging from Science Fairs, birthday parties, school carnivals, to corporate product launches, to Family Days. If you want something science related, we are able to do it! Contact us today to discover what we can do for you to liven up your event. 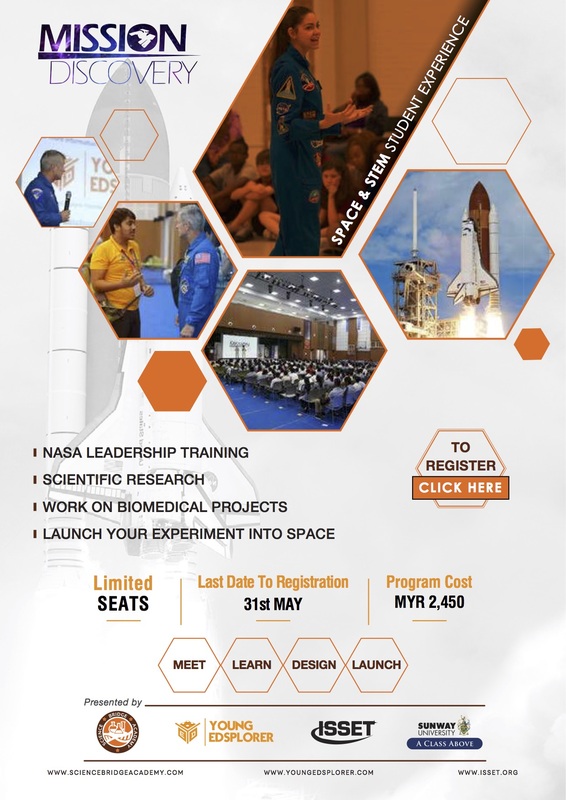 We are super excited and so proud to announce that the highly acclaimed Mission Discovery programme will be coming to Malaysia for the first time this November/December 2019! Brought to you by the International Space School Educational Trust, NASA, and Young Edsplorer, this Space and STEM programme presents a fantastic opportunity for students to have their experiments constructed and tested IN SPACE! How cool is that? To find out more details about the programme, CLICK HERE. Watch this video to find out more about Mission Discovery Asia! REGISTER NOW TO SECURE YOUR SEAT AT MISSION DISCOVERY!